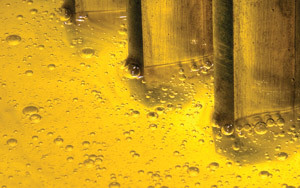 Most maintenance professionals know that clean oil can result in significant cost savings and that oil analysis can be used to reveal the state of lubricants and machines. 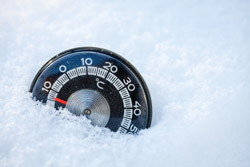 However, as online particle counters and other sensors become increasingly popular, it is important to be aware that one number does not tell the whole truth about a system’s conditions. It takes experience and a variety of tools to translate the vast amount of information that an oil sample carries. Understanding this language by using appropriate tools and efficient oil filters will help you reduce operation and maintenance costs associated with downtime, component wear and oil replacement. For example, consider an online particle counter installed to remotely monitor particles in hydraulic oil. It may show an ISO code of 16/14/11, which would lead you to believe that everything is perfect in the hydraulic system, but is it? Unfortunately, the particle counter cannot detect submicron or very large particles (greater than 200 microns), an installation fault in the counter, if the oil viscosity is off, or if additives have depleted. It also is unable to distinguish the oil color or smell, oxidation, acidity, varnish, water separation efficiencies (demulsibility), or problems with air release or foam. Therefore, you still need to perform traditional oil analysis and onsite tests. A sample can provide a lot of information about an oil’s properties and system condition, even prior to shipping it to the laboratory. The following onsite methods can help you translate this information into corrective actions and verify the filter efficiencies of your oil system. Examine the oil color. Is it comparable to new oil? Oxidation changes the oil color from amber to dark brown. Black usually indicates soot from combustion byproducts or entrained air causing micro-​dieseling. Check for air leaks at the suction side of the system pump. Do you see any large wear particles as black or shiny sediment? These would be greater than 100 microns. Use the crackle test (oil drop on a hot plate) to reveal the water level above 1,000 parts per million. Look for cloudiness, emulsions or free water. Does water ingress into the oil system? Check the oil’s demulsibility by mixing the oil with water (50/50) and time the separation. More than 5 percent emulsions or more than 20 minutes to separate means the water separation by coalescence or centrifugal forces is severely impaired. Engine oils, esters, polyalkylene glycols and most environmentally acceptable lubricants can keep water in suspension so there is no free water. Shaking an oil sample will indicate the foam and air-release properties. Observe how fast the bubbles release and rise through the oil. Look for surface foam. Oil containing particles, water and varnish will hold entrained air longer and may create foam. If the air rises slowly, have a lab test the air-release properties. Clean oil will release air faster and reduce the foaming tendency. Warm oil will dissolve varnish and water easily, while the same oil will be hazy and less clear when cold. Place the oil sample in the refrigerator overnight. A powerful light and a white paper with black lines will make it easy to see any difference. Varnish and water will fall out of solution in cold machine areas and result in jerky valve movements, corrosion, etc. Break off a piece of a used filter element. Iron wear particles are usually magnetic, so if a strong neodymium magnet can lift the material, you have problems with machine wear. You can also hold the magnet to an oil sample bottle to attract iron. Note that iron particles can be black like soot, shiny as silver or amber/brown like varnish/rust. If you can see iron in the oil or on the used filter, have a lab perform a particle quantifier/wear particle concentration test. 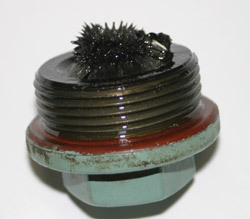 Inspect a used filter for shiny particles from metal wear, such as iron or brass. Break up the used filter element to see multi-layer buildup, which should be clean on the back. If not, the filter has not performed as intended. A USB microscope (magnifying 200-400 times) can reveal the color, size and shape of captured particles. Photos of magnified particles can tell more than a thousand words and help predict a wear situation. A ferrogram can show even more. A drop of used engine oil on chromatographic paper will reveal soot, glycol and fuel dilution. Excessive soot contamination causes the dispersant additives to deplete, which will form a black spot on the paper. Oil with good additives will lift soot particles easily and show a dark gray color across the paper. Glycol forms a black, sticky paste with sharp edges, which is unable to travel on the paper. Fuel dilution can be seen under ultraviolet (UV) light, as a fluorescent ring will appear after 24 hours. While the methods described previously can verify oil filter efficiencies, so can filter tests like the multi-pass test (ISO 16889). 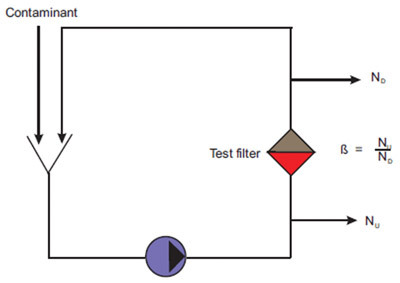 This test is designed for pleated pressure filters to establish a measure for manufacturers to illustrate the performance of oil filters. It can also be used by end users to compare the properties and performance of various filters. The beta value expresses an efficiency quota at a given particle size. 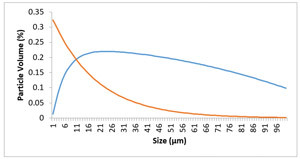 For example, Beta3=75 means for each 3-micron particle that has escaped through the filter, 75 pieces of 3-micron particles have been retained. This can be calculated into an efficiency percentage as: (1 – (1/75)) x 100 = 98.67 percent. Unfortunately, multi-pass tests cannot be used for depth filters. Most of these tests utilize medium test dust (ISO 12103-A3), which consists of large, lightweight ceramic particles. These particles are easy to capture in a pleated filter element, but at a constantly high ingress, they will block the surface of a dense cellulose depth filter. Therefore, the results will show only a fraction of the true efficiency and dirt-holding capacity of the depth media. In real-world applications, wear particles, such as iron, are heavy and will slowly press their way through the thin sheets in pleated filter elements, with any pressure pulses or shocks making it worse. Consequently, in most applications, an in-line pressure filter will not perform as well as its multi-pass test result. Adding an off-line depth filter is recommended to ensure performance. surfaces and crevices on special cellulose fibers. 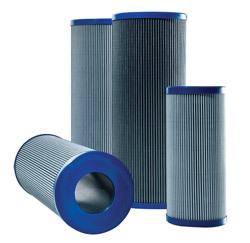 You may have heard that an oil filter made of cellulose is not as good as a filter made of glass fiber. If you are referring to pleated filter elements, then it is correct that a thin filter material of cellulose is not optimal. Water and particles will wear on the thin sheets, which will break over time. Caterpillar recommends an in-line pressure filter made of cellulose be used for a maximum of 500 hours with diesel engine lube oil. However, do not be misled into thinking that all cellulose depth filters are the same. Some depth filters incorporate a completely different design and do not wear over time. These filters use strong, specialized cellulose fibers for strength and improved filter efficiency, especially for the retention of very small particles. Then again, are extremely small particles (0.2 to 4 microns) important when particle counting most often looks at particles that are 4 microns and larger, e.g., 4, 6 and 14 microns? 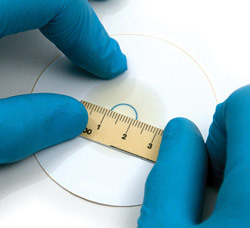 Consider the dynamic oil film thickness in gears, roller bearings and servo valves. They are all less than 3 microns. This is why off-line depth filters have been chosen for more than 80,000 heavily loaded wind turbine gearboxes running dynamic oil film thicknesses below 1 micron. When it comes to the retention of particles smaller than 6 microns, cellulose depth filters have excellent performance. They also have a high dirt-holding capacity for submicron particles and can maintain their capture efficiency even when loaded with particles. Thus, cellulose depth filters release few small particles under stress and pressure bursts. In addition, many of these filters can absorb water from oil, and some types can even remove varnish. High base number values and a lower acid number can be maintained if special cellulose blends are used to reduce acidity, oxidation byproducts and submicron particles. Installing an off-line cellulose depth filter can often result in longer oil service life, sometimes by as much as three to five times. For example, Volvo engines on mobile mining equipment are now running 1,500 hours instead of requiring 250-hour oil change intervals. The oil analysis results have also never looked better. In conclusion, used oil and filters carry a lot of information about your oil and machine components. Although it may not seem easy to interpret this information at first, there are a number of tools available to do so. Remember, all oil filters are not created equal and cannot be tested using the same standards. Keeping your oil clean, cool and dry is the most efficient way to reduce the operating and maintenance costs associated with downtime, component wear and oil replacement.